Are you tired of trying cheap, low quality cotton sheet sets over and over again? Well now is your chance to up the ante. Malouf’s Woven cotton sheet set have entered the market and are ready to impress. Will the Woven cotton sheets live up to the quality of previously tested Malouf products? Sleepopolis is here to put them to the test and find out! Keep reading below to discover how these sheets performed during this weeks accessory test. Cotton, cooling, and oh-so-cozy! Malouf's Woven Cotton Sheet Set is a classic bedding essential! Looking for a fast pass to the answers? Click here and you can skip right on down the the review summary. 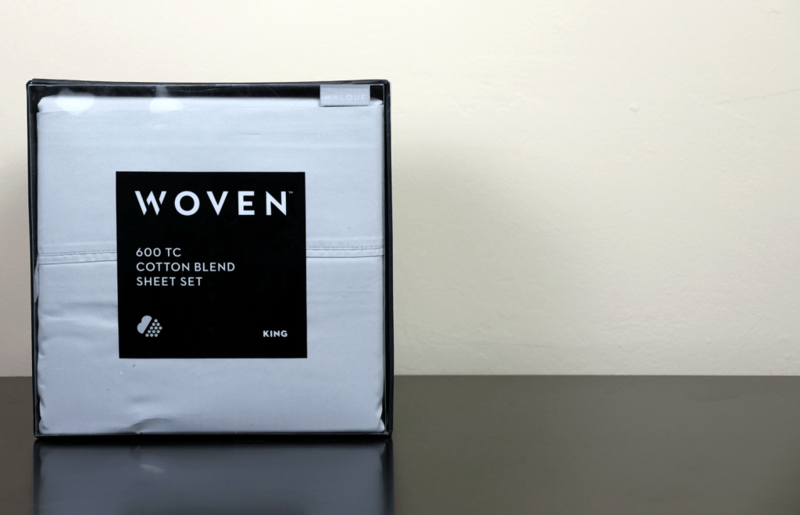 The Malouf Woven 600 TC cotton blend sheets are made from a blend of cotton (55%) and polyester (45%). The set includes a fitted sheet, a flat sheet, and two pillow cases. The sheets are finished with a 2 sides weave, creating a soft cotton side and a wrinkle-resistant polyester side. With a 600 thread count, the Woven cotton sheets can be considered a luxury cotton sheet set. The 600 thread count is a bit of a misnomer. Since these sheets are two sided Malouf is adding the sides together. Individually you have two separate sides, each with a thread count of 300, which is still very much in the luxury end of sheets. The fitted sheet uses a universal fit design, which contains two deep pockets, a thick elastic band, and the ability to fit mattress depths from 6-18″. The build quality of the Woven cotton sheets is most certainly above average. I determine this by examining every inch of the stitching, material quality, and overall construction. After examining the entire set very closely, I was only able to find a total of 3 loose threads that could not easily be removed. With that said, there were about 5-7 other threads that seemed to be excess threads from the stitching process and those were removed without any issues whatsoever. The few remaining threads did not appear as if they would cause any further damage to the sheets. The pillow cases were stitched to sheer perfection and the fitted sheet snapped right onto the mattress, creating a snug fit all the way around. All in all, these sheets seem very well made from every angle. While testing the Woven cotton sheets, I tailored my focus to a few major topics. To begin, shrinkage. 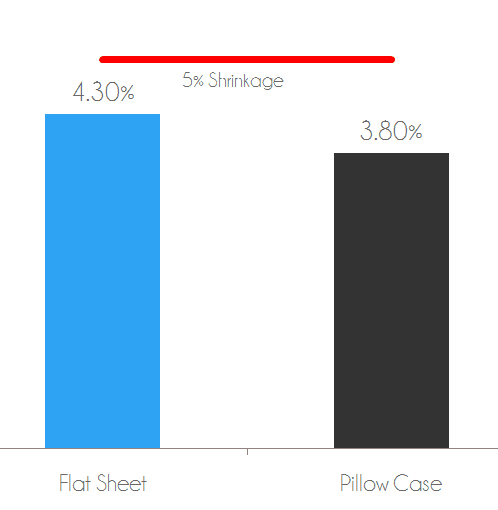 Shrinkage is the most widely discussed issue regarding a new set of sheets. As a consumer there is nothing more aggravating than purchasing a new sheet set only to wash / dry it and watch it shrink dramatically. Next in line, thread examination. Are there any problematic loose threads? Have any loose threads become more of an issue after normal usage? Have the existing loose threads increased in size after a standard wash / dry cycle? Finally, I test the colors and dyes to determine the material quality of the sheets. Shrinkage tests are key when testing a new set of sheets. To measure the shrinkage across the sheets I begin by taking measurements of the flat sheet and pillow case (prior to wash / dry cycle). These measurements will serve as my baseline for comparison. After washing the sheets I record the new measurements and compare them against the originals in order to determine the overall shrinkage of the sheet set. The Woven cotton sheets showed slight shrinkage, but still well within the normal range. 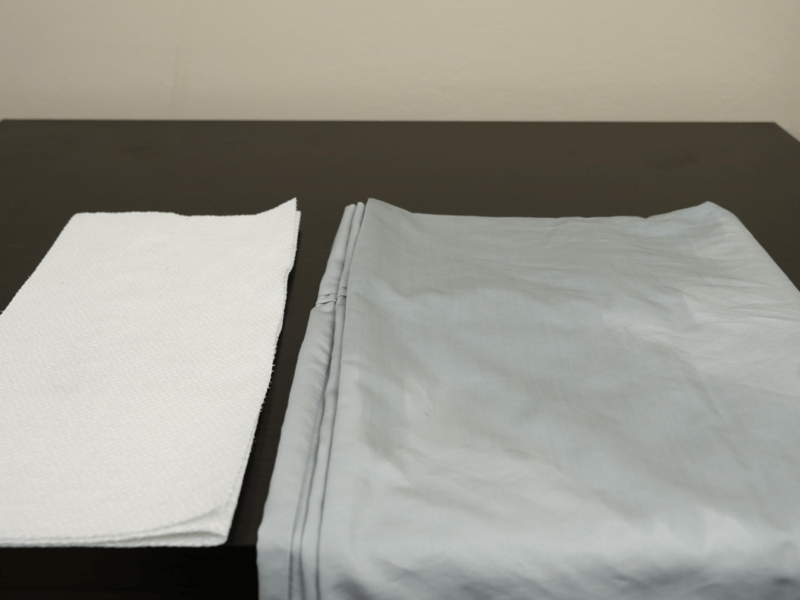 After comparing the two sets of measurements, the flat sheet shrank by 4.30% (compared to the original size) and the fitted sheet shrank by 3.80%. Any amount of shrinkage below 5% is good. Shrinkage test – flat sheet shrank by 4.3% after wash / dry. Pillow case shrank by 3.8% after wash / dry. During this test I dig a little deeper into the sheet set for any new or additional damages that could have derived from several weeks of normal usage or standard wash / dry cycles. After thorough assessment of the sheets, the Woven cotton sheets seem to have held up extremely well. Upon completion of this test, along with my sleep test, there were no new damages and none of the existing loose threads became more of an issue. The color test is designed to show any sort of color / dye run off from the sheets. To get this test rolling, I soak a pillow case in warm water and allow the case to fully absorb all of the water. Next, I ring out any of the excess water with my hands and proceed to place the pillow case on top a bed of paper towels. After doing so, I take a rolling pin and firmly press it against the pillow case. Once this is complete, I remove the pillow case from the bed of paper towels and examine the paper towels for any color / dye run off. Final examination of the paper towels led to the conclusion that the Woven cotton sheets are made from high quality materials. There was no sort of color run off whatsoever. The Woven cotton sheets have a soft, welcoming feel about them. While they are quite thin, the blend of cotton and polyester provides an enjoyable feel that I have not experienced with other blended sets. On a scale of 1-10, where 1 is the softest, I would rate these sheets between a 2.5-3. Although this level of softness is somewhat expected from a cotton sheet set, the polyester mixed with the cotton gives this set a more unique feel, adding a degree of flexibility to the sheets. Cooling is most certainly an added bonus with the Woven cotton sheets. After testing several cotton sheet sets, I have set somewhat of a standard as far as how cool each set should be. Although most of these cotton sets do sleep fairly cool, the Woven cotton sheets were a notch better. The breathability of these sheets is on par with the best 100% cotton set I have tested to date and a noted level better than average cotton sheets. The design of these sheets allows them to breathe extremely well. 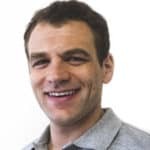 This is a major plus for those sleepers who really love the feel of cotton sheets, but tend to avoid them simply because of the lack of airflow. Finally, the style. Malouf’s goal with these sheets was not to blow people out of the water with their colors or patterns. Instead, they seem to have went for a more traditional look, with solid colors and a flourishing, wrinkle-resistant weave. 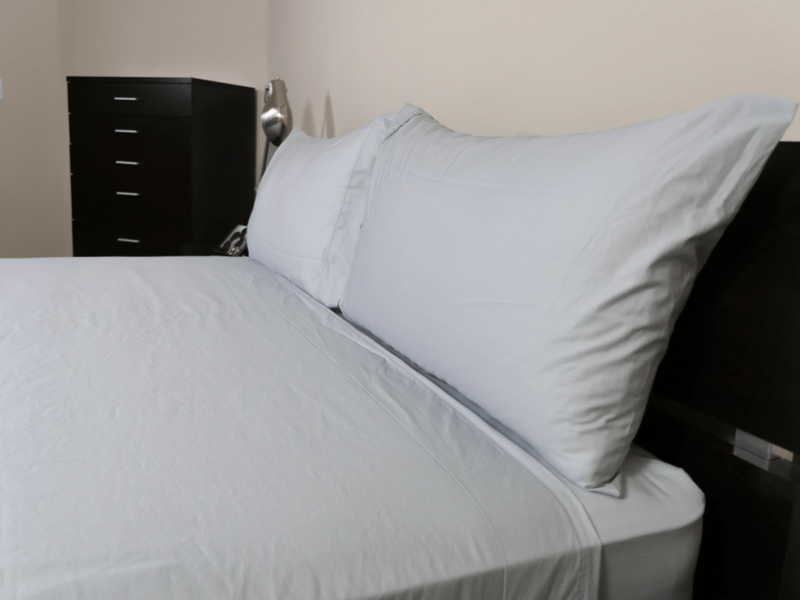 Even so, these sheets give off a sleek, luxurious look and are available in 4 different colors. Who should by the Malouf Woven cotton sheets? Want cotton / polyester sheets – these sheets are made from a blend of cotton (55%) and polyester (45%). The blending of these two materials makes for a stretchy yet soft feel. Want a soft feel – a 600 thread count and 2 sided weave gives these sheets a very soft feel. Want cooler sheets – the use of polyester in these sheets gives them a cool to the touch feel. Additionally, the sheets breathe very well, avoiding any sort of heat build up or trapping of heat between you and the mattress. Want luxury + value – at $70 for a Queen set, these sheets are by no means cheap. Yet, they are still a solid buy for the money. For more on the Woven cotton sheets by Malouf visit Amazon.com. Made from a blend of cotton and polyester, the Woven cotton sheets by Malouf are quite impressive. From a quality build to a soft feel, these sheets are among the nicest cotton sheets Sleepopolis has tested to date. A 600 thread count and quality build make for a dependable sheet set that is made to last. Additionally, a high level of breathability and a luminous sheen give these sheets a luxurious look and feel all around.